Survival International reflects on why travel to tribal peoples can be unethical and dangerous. As humans, we move. We travel; we always have done. Journeying is hard-wired in the human psyche; we migrated from Africa thousands of years ago, walking out of the savannah to the rest of the world. So we travel for knowledge, for pleasure, for enlightenment; to ease the tedium of daily routine and satisfy the imaginings of curious minds. We travel to shake up our souls and to placate an atavistic restlessness within us. Ernesto Che Guevara thought that we simply ‘travel just to travel’. Now, it seems, we want even more. We want to go higher, further, wilder. As the world becomes increasingly homogenized and urbanized, so, perhaps, the call of the unfamiliar grows louder and the reasons for travelling to remote corners ever stronger. 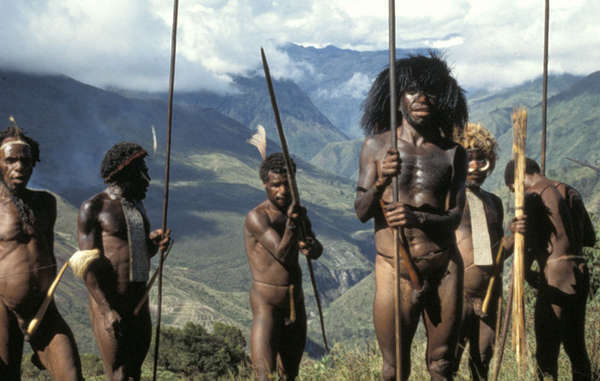 But this is where ‘adventure’ travel also becomes extremely dangerous – for tribal peoples. The faraway places seen in guides or advertised by tourism companies, from the green depths of the Amazon basin to the blue ice of the Arctic or the highlands of West Papua, are often the homes of tribal peoples. One man’s ‘landscape’ of escape is, quite simply, another man’s home. Tribal lives can be severely disrupted or even threatened by tourism. Their ownership of the lands they inhabit is recognised in international law, and should be respected regardless of whether the national government applies the law or not. When in tribal territories, tourists should behave as they would on any other private property. 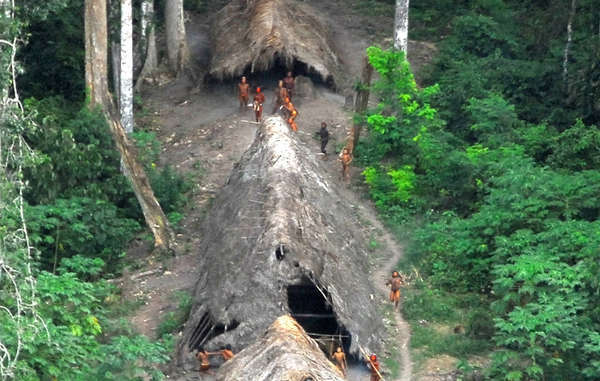 Uncontacted Indians in the Brazilian Amazon, May 2008. Many are under increasing threat from illegal logging over the border in Peru. It can also be lethal for tourists to be anywhere near little-contacted peoples. Such peoples are likely to react with hostility towards outsiders, while tourists can transmit infectious diseases to which little-contacted peoples have no immunity. ‘There’s nothing wrong with tourists visiting tribal peoples who have been in routine contact with outsiders for some time, but only if the tribal people want them to, have proper control over where they go and what they do, and get a fair share of the profit,’ said Stephen Corry of Survival International. Dani Men, 1991 Baliem Valley, West Papua. Tourism poses a great threat to the health of the endangered Jarawa people of the Indian Ocean’s Anadaman Islands. Tour operators have been driving thousands of tourists every month along the illegal Andaman Trunk which cuts through their reserve in the hope of ‘spotting’ members of the tribe; rather like a sinister human ‘safari’. An epidemic could annihilate the hunter-gatherer tribe. There is hope, however – after Survival recently called on tourists to boycott the trunk road, six of the tour companies, moved by the Jarawa’s plight, have come out in support of the boycott, with some even helping to hand out leaflets leaflets appealing for a wholesale tourism boycott of the road at the island’s airport. Until the road through the Jarawa territory is closed, however, the threat remains. So where travel and tribal peoples collide, the reasons for travel need to be carefully analysed. Travellers thinking of visiting tribal areas need to think about the long-term effects their visits might have on tribal peoples, not the fleeting thrill of the experience or the glory of the story once back home. The joy of journey and discovery – the need to ‘find the beautiful’, in Ralph Waldo Emerson’s words – is not justifiable when it places tribal peoples at risk.